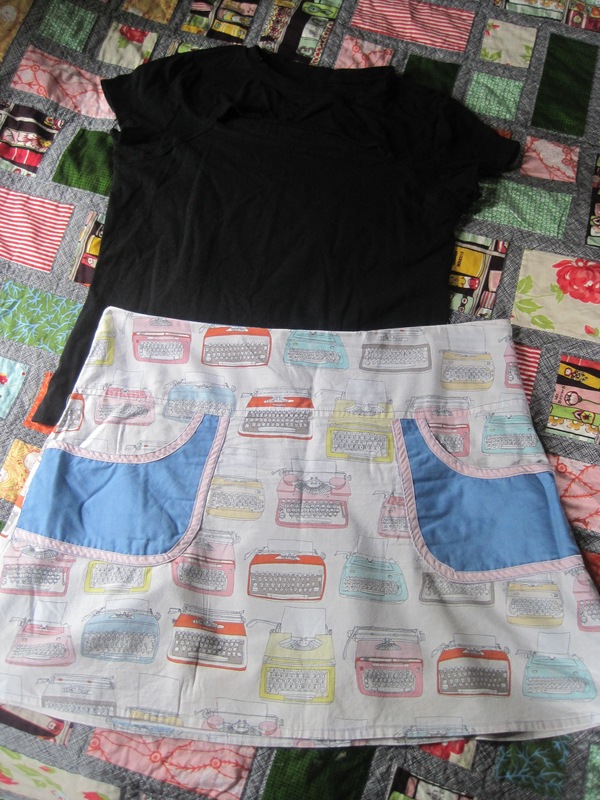 bluegingerdoll anne t-shirt (you can’t really see the cut-out here, but it exists) & typewriter print A-line skirt. 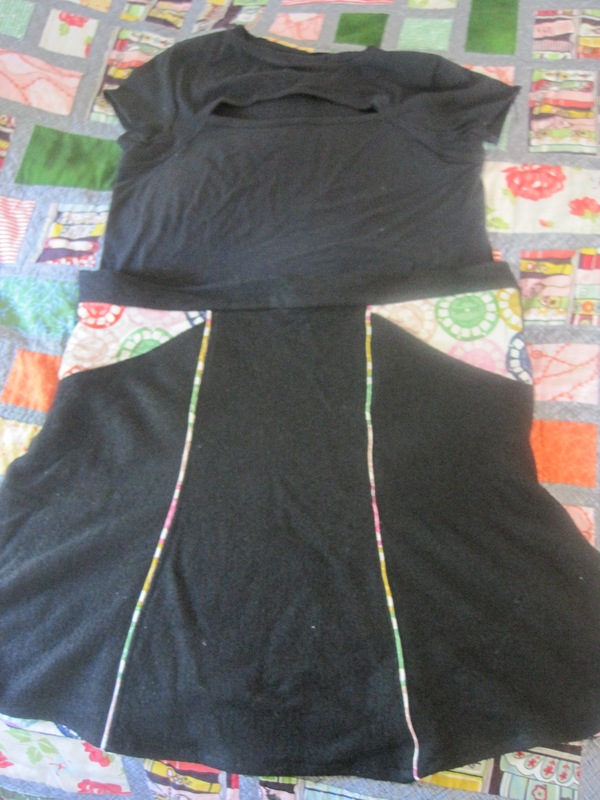 worth noting: the skirt is the first garment i ever made (which is kind of obvious from the wrinkly bias tape on the pockets). it’s still in regular rotation even when i’m not going deep into the archives to put together me-made outfits. this was my first time wearing the t-shirt. i kind of hated it at first, but got a lot more into it as the day went on. pink brontë top, feather print layered A-line skirt, tricot butterick 6031 underpants, peach/ivory elan 645 bra. this was kind of a weird outfit that came together better than i expected. the navy blue buttons on the shirt picked up the blues in the skirt & balanced out the fact that there’s no hot pink in the skirt. i am still finding such a brightly colored shirt kind of difficult to wear though. it’s just not my jam. black floral ponte de roma vogue 1411 pants, heavily-altered colette licorice dress, floral rosy ladyshorts. this is admittedly an insane outfit. the situation is that i really wanted to wear this dress, but jared really wanted to take ramona to a strawberry farm. i could have stayed home & sewed or something, but i find that i get kind of depressed if i don’t go outside everyday, & i always have weird regrets when jared takes ramona on some novel outing & i skip it. but i knew i’d want to wear pants if i was picking strawberries. so…pants under a dress. living it up 1995-style. i was hoping i could pass the pants off as leggings, which didn’t really work, & i also got strawberries all over the entire outfit. oh well. at least i got re-acquainted with the dress, which is sewn better than i remembered, even if fisheye darts are not really a friend to my body. 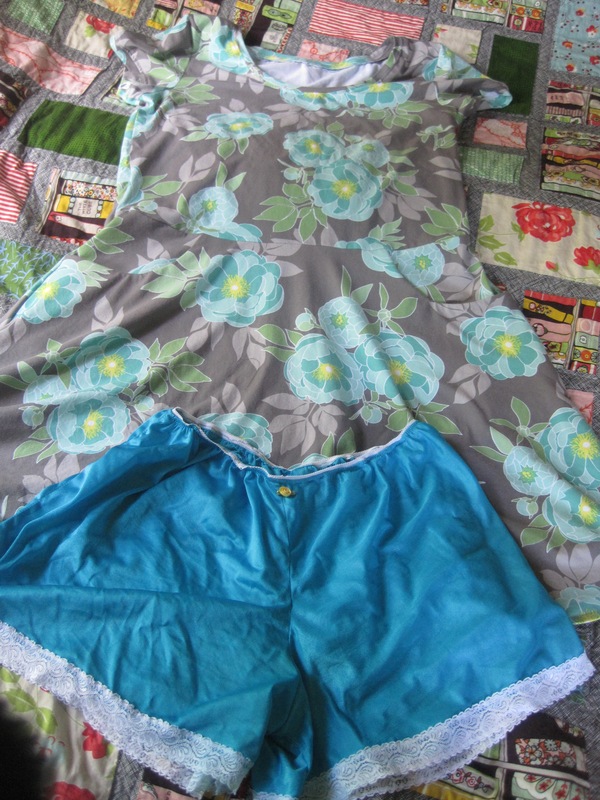 floral print lady skater dress with side-slant pockets & turquoise tricot self-drafted tap shorts. truthfully, it was too cold for this outfit (i wore it with a hoodie), but i had just finished hemming the dress that morning & was too excited not to wear it. the color coordinating of blues & yellows (the tap shorts have a little yellow flower sewn on at the waist) was just a happy accident. 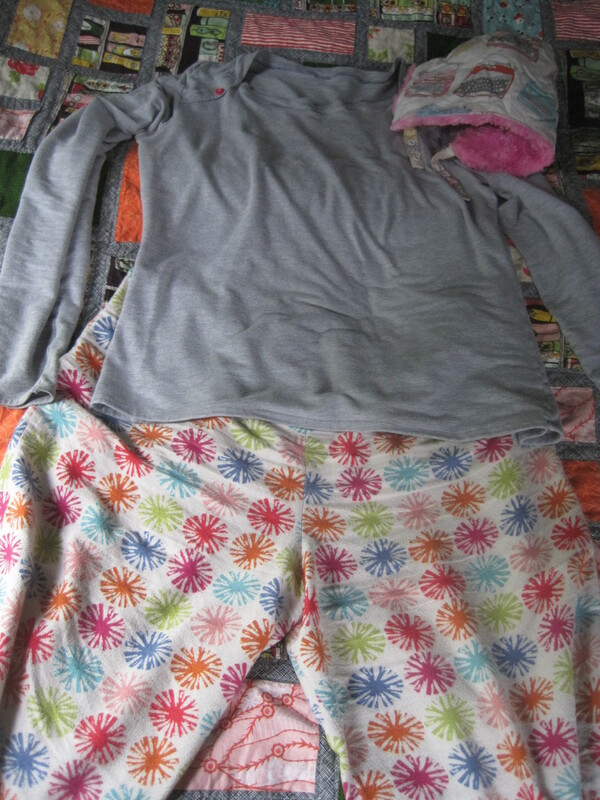 flannel pajama pants, gray long-sleeved brontë top, typewriter print winter hat of my own design (lined with hot pink minky!). it was freezing today! i was too cold to think straight, & super-tired, so i just stayed in my jammies all day (& added the hat for extra warmth). i didn’t want to turn on the heat because we’ve already installed the air conditioners & put a rug over the air intake (ramona was dropping crayons down it), so i just snuggled in warm pajama layers & went right to bed when jared got home from school. bluegingerdoll anne t-shirt (you can see the cut-out a lot better in this photo) & self-drafted black boiled wool gored skirt. it’s still pretty chilly, so totally fine weather for a wool skirt. add a hoodie & some tights & we’re good to go. unfortunately, this outfit has forced me to accept that i can’t really wear wool. i always knew i was sensitive to it (it makes me really itchy), but somehow i thought i could mitigate that by sewing wool garments myself. nope. wearing this skirt, even with tights & my shirt tucked in, so no wool is actually touching bare skin, makes me want to tear my epidermis off. & this makes me all the more unlikely to ever take up knitting, which seems like a great big cult of wool. the second ramona is down for her nap, i’m changing back into my nice flannel jammies. it’s a shame, because the viewfinder print accents on this skirt match the viewfinder print bag i made recently, so from a purely aesthetic standpoint, this outfit is awesome. so! i continue to learn valuable lessons from this exercise, & i continue to rue my lack of me-made black t-shirts & basic fly-front pants. (these holes in my wardrobe will hopefully be remedied soon.) 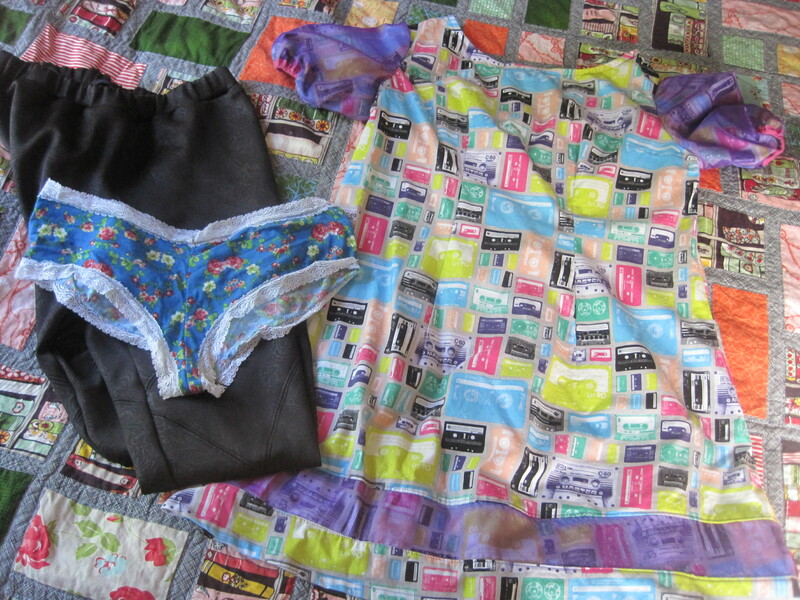 i’m going to have to slow down on the sewing though & start getting serious about packing up the house. i managed to go through the clothes in my closet & prune the garments that need to be donated or simply thrown out (too stained or torn up to keep or pass on) & that’s as far as i’ve gotten. every time i go to the basement (which happens a lot, because that’s where the washer & dryer are), i feel despair over all the crap down there that needs to be sorted, cleaned, packed, etc. jared is going to have to do it because everything needs to be de-spiderized & that’s not something i do. (as jared put it, “we need to make sure we don’t actually bring a spider-built trojan horse to our new house.”) we still have two months before we move, but it will go fast. I loved dresses over pants, someone needs to bring them back into style. 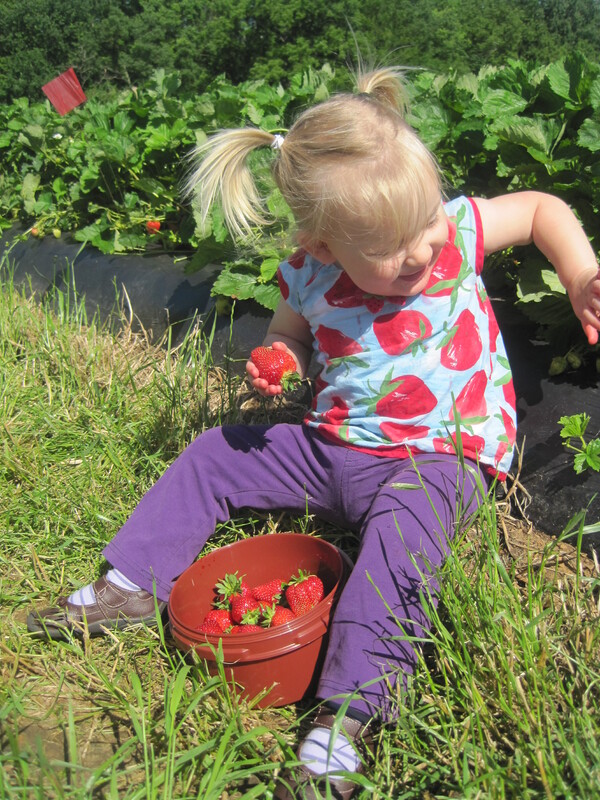 apparently it’s a parent law that if you have an outfit for your kid with strawberries on it, they must wear it to the strawberry patch.